Imagine the medical possibilities of monitoring a person’s digestive tract from the inside out. 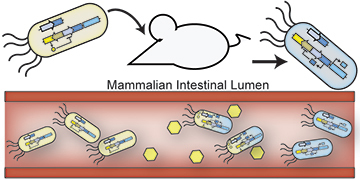 With a team of scientists from Dr. Pamela Silver’s lab at the Wyss Institute and Harvard Medical School, Dr. Jonathan Kotula and his colleagues including Dr. Jordan Kerns and Dr. Jeff Way, engineered bacteria to sense environmental signals within the mammalian gut. 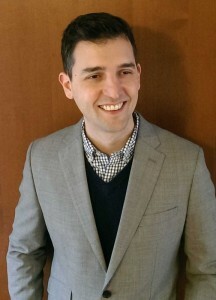 Dr. Jonathan Kotula is a postdoctoral fellow in the Department of Systems Biology and the Wyss Institute for biologically inspired engineering at Harvard Medical School. He is an entrepreneurial scientist who has developed engineered probiotics, novel therapeutic delivery techniques, and devices for preventing hospital-acquired infections. His diverse work has a common theme of translational research, which builds upon basic biomedical discoveries to develop therapeutic innovations. He earned his PhD from Duke University. Trillions of bacteria live on our skin, mouths, noses, and throughout our gastrointestinal (GI) tracts. The species that live in our GI tract, called the gut microbiota, interact closely with our immune system and have a profound impact on how we feel every day. For example, disruptions in the gut microbiota may lead to Crohn’s disease, inflammatory bowel disease and colorectal cancer. We have engineered E. coli – one of many bacteria that live naturally in our guts – to monitor the health of the gut environment. These engineered bacteria could radically transform the way we diagnose and treat gastrointestinal disorders. The genetic system we engineered into the bacteria’s genome consists of a ‘trigger element’ that responds to an environmental stimulus, and turns on a stable ‘memory element’ that remembers the stimulus for many generations. We designed this memory element based on the genome of lambda, a well-studied virus that infects E. coli. We delivered a lab strain of engineered E. coli to mice, and then treated the mice with stimulus. The engineered bacteria recovered from these mice had all switched to the ON state, while those recovered from untreated mice remained in the OFF state. In effect, the bacteria “remembered” what they saw in the guts of the mice! Remarkably, we were able to isolate and engineer a native strain of E. coli from the mouse GI tract—and our genetic switch worked even better in this “native strain”. This work demonstrates that bacteria engineered with memory systems can survive and function within complex environments such as the mammalian gut, that it may be possible to engineer your personal microbiota, and that engineered bacteria may be developed into non-invasive diagnostics and therapeutics. In fact, we envision a day when a doctor would prescribe a probiotic pill containing bacteria engineered to monitor any number of conditions from inflammation to disease markers. Then by analyzing a stool sample your physician would obtain a very clear picture of the health of your GI tract, providing a non-invasive alternative to colonoscopies.